Lost: 9 Apr, 1942 Sunk by aircraft bombs at Malta. Later salvaged. The British Force K, made up of the British light cruisers HMS Aurora and HMS Penelope and the British destroyers HMS Lance and HMS Lively, intercept an Italian convoy some 130 south-west off Calabria in approximate position 37.08N, 18.09E. The Italian convoy is bound from Naples to Tripoli. In the resulting battle the Italian destroyer Fulmine is sunk as well as the German transports Duisburg (7389 BRT) and San Marco (3113 BRT), the Italian transports Maria (6339 BRT), Sagitta (5153 BRT) and Rina Corrado (5180 BRT), and the Italian Conte di Misurata (5014 BRT) and Minatitlan (7599 BRT). 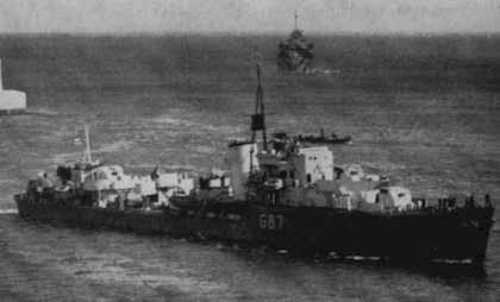 The Italian destroyers Grecale and Euro are damaged. The British Force K, made up of the British light cruisers HMS Aurora and HMS Penelope and the British destroyers HMS Lance and HMS Lively, intercept an Axis convoy some 100 miles west of Crete. The Axis convoy is bound from the Aegean to Bengasi. The two German tansports in the convoy Maritza (2910 BRT) and Procida (1842 BRT) are both sunk by HMS Penelope and HMS Lively dispite the precense of the Italian torpedo boats Lupo and Cassiopea. While on their way to intercept an Italian convoy bound for Tripoli the British Force K (light cruisers HMS Neptune, HMS Aurora, HMS Penelope and the destroyers HMS Kandahar, HMS Lance, HMS Lively and HMS Havock) ran into an newly laid Italian minefield. HMS Neptune and HMS Kandahar sank while HMS Aurora was badly damaged and HMS Penelope was lightly damaged. HMS Aurora was patched up at Malta before returning home for repairs at Liverpool from April to June 1942. HMS Penelope was repaired at Malta but was bombed on 26 March 1942 while still under repair. She left Malta on 8 April 1942 for full repairs at the New York Navy Yard in the USA. These repairs were completed in September 1942.